It’s long been known that smoking during pregnancy can lead to premature labor, low birth weight, and a higher risk of death in infants due to SIDS. New research has now found a link between smoking during pregnancy and hearing loss in children. Both humans and mice were studied by researchers, and those who were exposed to nicotine had a higher probability of developing abnormalities with their auditory brainstem. They were also more likely to smoke or have substance abuse issues in adulthood. Children who were exposed to nicotine prior to birth are three times more likely to develop low-frequency hearing loss than those whose mother’s did not smoke. Researchers also found that study participants who endured prenatal nicotine exposure were more likely to smoke or have substance abuse issues as an adult. Their higher risk of participating in dangerous actions as an adult was directly related to their nicotine exposure in utero. They were also more likely to suffer from learning disabilities in school such as Attention Deficit Hyperactivity Disorder (ADHD). Studies have also been performed on mice to determine how nicotine exposure affects their development. One particular study had researchers add nicotine to water in order to replicate nicotine levels in the blood of humans who smoke heavily. Pregnant mice then drank the water. After the mice gave birth, their offspring were studied for three weeks. Researchers found that mice who were exposed to nicotine during and after birth showed difficulty with their auditory brainstem function. Specifically, neurons from the cochlea had trouble communicating with other auditory brainstem neurons. Researchers caution that more studies need to be performed in order to determine if exposure to nicotine affects other parts of the auditory system. While researchers are busy conducting more studies to find out how much nicotine exposure affects a child’s hearing, the most important thing pregnant women can do is to not smoke. They should also avoid exposure to secondhand smoke. The health effects to the unborn fetus are numerous and dangerous. Not smoking around their child. Not smoking in their home, car, or any other area where their child may go. Ensuring that the schools, playgrounds, restaurants, and other public areas their child visits are tobacco-free zones. If a parent suspects their child is having learning difficulties in school, they should request that they be tested for auditory processing disorders. Initial tests can be performed at school or at their pediatrician’s office. 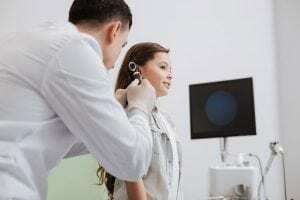 If an auditory processing disorder is detected, further testing can be done at a qualified otolaryngologists office.